By road: The Bridal Train in Annelund is located along road 182 between Vårgårda / E20 and Ulricehamn and between Herrljunga and Borås. Signs with the text “Gravfält” point the way where you take off from road 182 in the eastern part of Annelund. There is space for a few cars at the path to the burial site. As with Lundskullen and Nycklabacken is also The Bridal Train in Annelund close to Nossan. However here the landscape is more forested with fields and meadows gathered near the river. Like around Lundskullen and Nycklabacken here are numerous of stone settings, mounds, rock carvings in the form of cup marks, and in the higher surroundings stone mounds. It shows that the site were a rich settlement during the Bronze and Iron Ages. 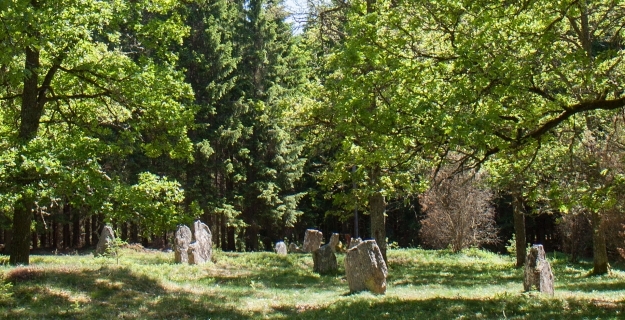 The burial ground is located in Hov parish in Annelund. According to Swedish Place Dames Dictionary (Svenskt Ortnamnslexikon) Annelund was originally the name of a farm. It also states that the name Hov “in its oldest discernible meaning is’ height’, yet living in Norwegian dialects”. The name Hov occurs about 35 times in Sweden. It corresponds to the Old West Norse hof, which is usually translated ‘temple, house of gods’. 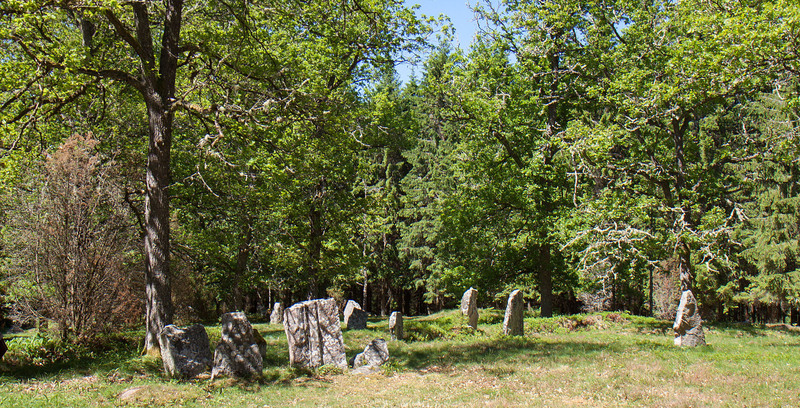 On the burial site there are 32 standing stones, 15 round stone settings and at least 3 stone rings.